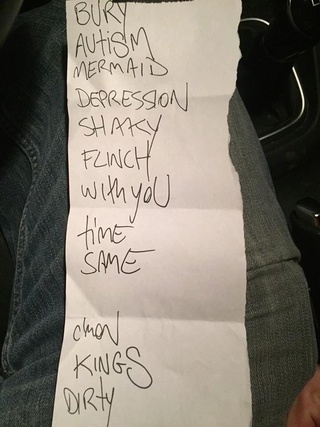 The record release shows in California kicked off the Bury Me In Philly tour cycle. 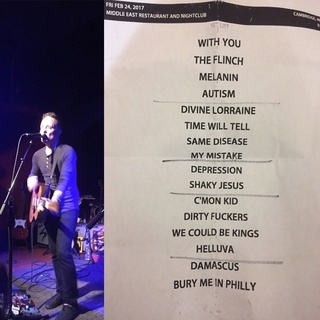 The westcoast record release show run started in Philly yesterday. For the unlucky fellows who missed the live stream, here are some Instagram clips and videos. Thanks again to Steve for the pic! Thanks to Josh for the pic! I gotcha Susan Sorry for the delay. 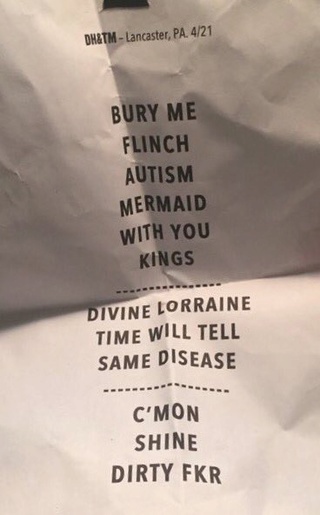 Here's the setlist although I can't figure out how to get the image to not be sideways. It's normal on my computer. Thanks for keeping record of this stuff as always!! 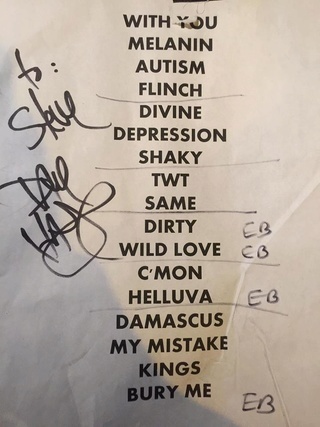 Thanks for the setlist Shelby! @escondido Took some blurry pics at the merch tonight. I´ll try again tomorrow. That's a good idea to take some merch pics, I am also interested in what they sell. Some cool black shirts I hope for. What a fantastic concert yesterday evening in Munich! Pure energy, much much power on the stage! Great gig I think so! Support bands were ok, but not more than that. Not my favorite ones. Here are my videos, hope You like them! Thanks for sharing your videos! Would have been nice to meet you. Next time! 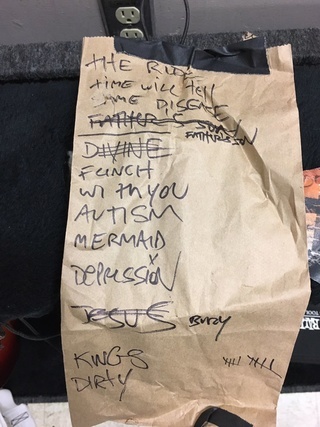 The tour started in Cologne; First show in Germany after almost 3 years, very first show of Dave Hause & The Mermaid in Europe and recorded by German television with cameras all around. Not quite an easy way to start. The performance was good, but (understandably) a little bit restrained. The next show in Hannover in a smaller venue was more intimate and already more energetic. The next afternoon, Dave played an acoustic set at the new Ramones Museum in Berlin which had just opened half an hour before (and wasn´t really finished). At the regular show in Berlin later that night it finally clicked and started to feel again like it should. This was one of the best shows on this tour, much energy on stage and in the audience. The next night in Münster Dave was still full of this energy and jumped down stage to sing on the barrier right from the start (I think he was pretty pissed about the wide gap between the stage and the audience). Wiesbaden was the biggest show and a good one. In Vienna Dave surprised us with playing Trusty Chords, a kind of apology for staying away for so long and a deal with the Trusty-Chords-shouter to come back next time with a friend. Munich was another very good show, Zurich and Stuttgart were rather calm. In Stuttgart Dave achieved his aim to play every song from all three records on this tour in Germany. Amsterdam was wild and, as expected, another highlight of the tour before it got worse in Hasselt. They had technical problems with the mics in Hasselt and got electric shots in the mouth throughout the show. When Dave had enough, he unplugged his acoustic guitar, left his mic behind and played a complete unplugged version of Wild Love as last song. 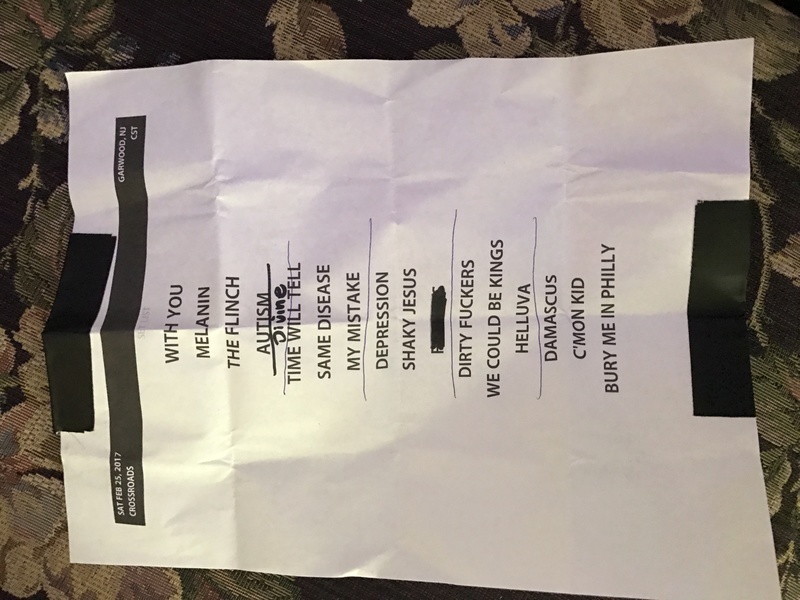 So the mood was not the best and the set was quite short. It was also in Hasselt, where this horrible accident happened to Drew (the drummer of Dead Heavens) in which a piece of his finger was sheared off. He was taken to a hospital where he was given stitches. The first UK show in Brighton was on Dave´s Birthday. We had planned some Birthday surprises and Manuela had organized a cake, banners, glowsticks and balloons. Dead Heaven played a complete different, dark and short set and Drew´s finger started to bleed again during the show. Despite this bad situation, the mood wasn´t ruined for the rest of the show. It was a really nice Birthday party/show and we all had a lot of fun on stage and in front. The next night in Leeds it turned out that Dead Heavens had to cancel the rest of the tour because Drew´s injury was much more serious than they had thought. Bad news - bad mood. Dave and The Mermaid played professional, flawless shows in Leeds and Manchester. But without the usual fun and smiles. Helen Chambers filled in as support in Leeds and Kayleigh Goldsworthy undertook the support for the rest of the tour, except for the London show where Sam Russo opened. The good mood, fun and smiles were finally back in Glasgow. 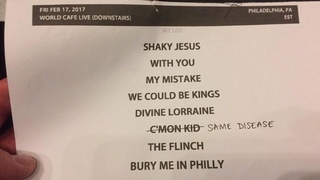 I though Dave would maybe cover a Frightened Rabbit song again, but he just worked a little part of Holy into Shaky Jesus. It was a great show even though I don´t know why there is a barrier in such a small club where even crowd surfing is not allowed. London was another tour highlight with a lot of friends and gigbuds. And another surprise; Dave played an acoustic version of Jane. And he promised to come back to the UK as soon as possible. The coolest venue of the tour was definitely The Thekla in Bristol – a boat in the harbour. The show was on St. Patrick´s Day, the audience was pretty relaxed, an overall nice evening. The O2 Academy in Birmingham felt a bit too big for the amount of people being there but at least there was some room for dancing. 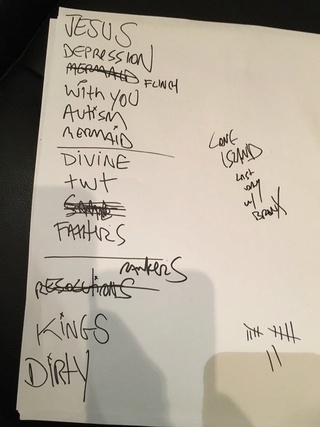 Dave played a new, unreleased song called Tradesman, one of the songs that are already recorded but not mixed yet. I really liked the song and I wish there will be another release soon! It was the last night for most of my gigbuds which means drinks and goodbyes afterwards. Btw, I met friends and gigbuds at every show throughout the tour which was pretty awesome. The last night of the tour in Nottingham was special for me because it was also my 100th Dave Hause show. Some days before Dave had asked me for a few songs I would love to hear. 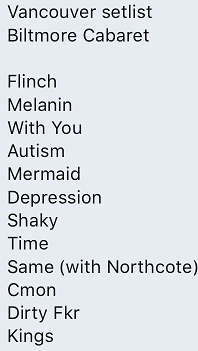 I had sent him 4 songs and thought he would choose one that fits into his set. They opened the show with an amazing cover of Johnny B. Goode by Chuck Berry who had passed away the day before. When Dave played my first request Seasons Greetings From Ferguson, I was more than happy because I haven´t heard this song live until then. And when he played a snippet of Louisiana in Father´s Son and showed me two fingers afterwards, I knew immediately that he would play all my requests. And right, Before and Rankers & Rotters followed later. 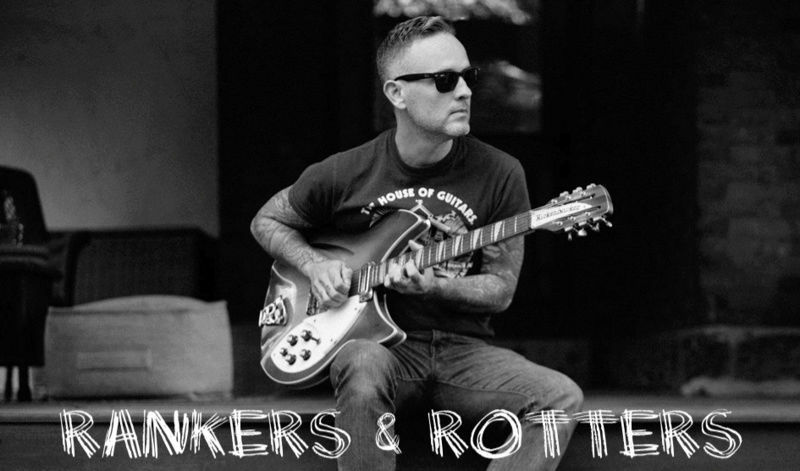 I also got a Rankers-T-Shirt as a present with my name, “the ones who stay” and “one hundred shows” on it. I have no idea how they had it printed on tour without a single day off. 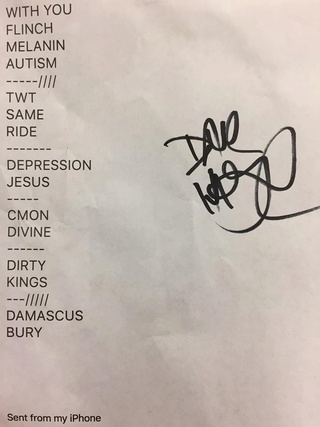 All this made the last show something really special and proved once more that Dave is the best favorite artist a fan can wish for! I´ll try to collect and post links to all the reviews, photos and videos later this week. 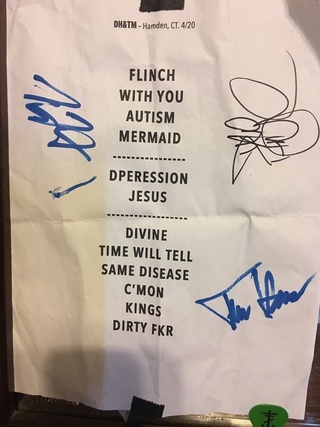 My favorite Canadian Matt (Northcote) joined Daved on stage for Same Disease last night in Vancouver! The Mermaid were the openers this tour, but, as everyone who has ever seen Hause perform in any capacity knows, he always steals the show.